This Wednesday, one of my favorite series out right now continues. The Fall and Rise of Captain Atom is a part of DC Comics’ Rebirth line. As far as I know, this is a limited series. There aren’t any plans for Nathaniel Adam after this six-part story. Still, I was beyond excited when I found out about this series because Captain Atom has turned into one of my favorite heroes in all of comics. Earlier this year, I did a series on heroes the DCEU needs, but don’t yet deserve. Captain Atom was one of those heroes. If you want to read that article, so you can understand the character a bit better, it’s linked below. In that article, I talked about why I love this character. But to recap, this character is a tragic one. Nathaniel Adam was a normal pilot in the United States military. He was a Captain. He enjoyed the pleasures that every human enjoyed. Food, love, and the freedom to do whatever you want. As a pilot, Nathaniel was born with an extra sense of wonder and adventure most of us don’t have. You could say that he was truly alive. An accident from a voluntary experiment turned him into the nuclear powered being known as Captain Atom. He absorbs energy and can affect the molecular structure of almost anything. He can time travel as well and has the ability to listen to radio waves throughout the world. In an instant, he goes from human, to the farthest thing from it. This is why I love the character. His tragic nature is comparable to Doctor Manhattan, from Watchmen. Atom has always maintained a positive outlook on life however. Towards the end of his New 52 run, he becomes more somber towards humanity. He exiles himself to the moon, claiming he doesn’t belong on Earth anymore. This is where the Fall and Rise picks up. The thing I liked about this issue though is how easy it is to read. You don’t need to read his New 52 run to comprehend the story. Although, I highly recommend it because it helps you connect with the character on a deeper level. If you just want to experience this character without reading that though, your experience won’t be hindered at all. I was interested at how this series was going to play out. Since it’s only a six-part story, I immediately had the thought of them killing Nathaniel off. But then I remembered the story was called the Fall then Rise, so I was hopeful that DC was going to give this character the respect he deserves. I wasn’t expecting this issue to be so good. It had different writers and artists than his New 52 run, so naturally I was nervous. But, the first part of this story flows so effortlessly and is written well. It starts off with Captain Atom sitting in a lab. Atom is in a lab called the Continuum. Instantly, we’re introduced to two characters who were prominent figures during his N52 run. Dr. Megala blames himself for what happened to Nathaniel. He’s a scientist who is extremely fascinated with his powers and is determined to understand their potential and how they relate to the universe. The other character is a stereotypical military man named General Eiling. He wants what all stereotypical military men want in comics. He sees Captain Atom as a weapon. Cool thing about Atom though, he doesn’t do what people want him to. He lives his life and if he doesn’t want to be a part of an experiment, he won’t be. Anyways, Atom is suffering from quantum flare ups. In other words, he’s sick. Except when Captain Atom gets sick, people can die. Megala is trying to explain what’s going on to him, but it’s nothing but science jargon. This is where I have to give props to artist and colorist Will Conrad and Ivan Nunes. They make Atom look amazing in this issue. The sadness on his face is palpable. He is done hurting people. Up until this point, his powers have never physically hurt anybody. But now, an incident that even saw the Justice League get involved, has pushed him to the edge. He tells Dr. Megala that he’ll miss him. Captain Atom then tries to overload himself with energy. He tries to commit suicide. 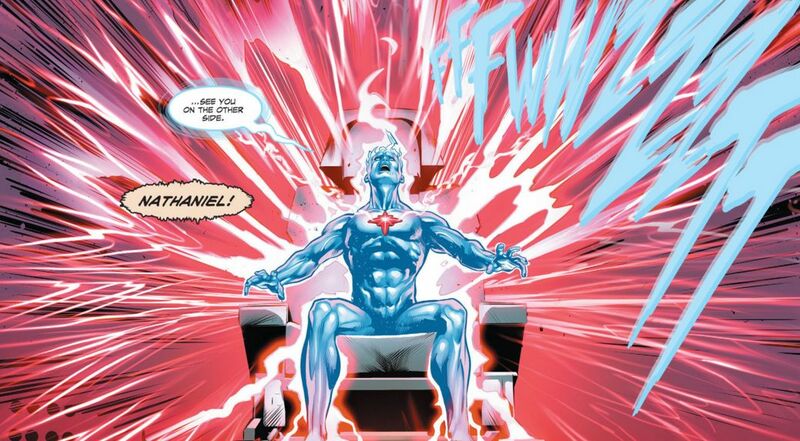 Once again, more great art here from Conrad and Nunes as Atom has a red energy field around him. The issue then flashes back 23 minutes earlier to the incident. We see Captain Atom flying over an ocean. He’s talking to Megala, who’s back at the Continuum. They mention his exile to the moon briefly, but then we learn that he’s been injected with a nano-com array which allows Megala to monitor Atom from a subatomic level. Atom continues to fly and notices a boat being swept up by a wave. Not just a boat, but a cruise ship. He decides to try and rescue the people before it’s too late. Megala warns him not to, but like I said before, Atom does what he wants to. He isn’t a government pawn. The public have a negative perception of Captain Atom. They aren’t the only ones. The Justice League and a number of other superheroes don’t trust him either. They consider him to be a volatile hero. The people on the boat are uneasy at first about Captain Atom saving them. He eventually saves the people on the ship and flies away when a quantum flare up happens. Megala explains it to the readers. The source of Captain Atom’s powers occur from his atoms simultaneously forming and splitting. This type of reaction can be powerful but also dangerous. His atoms are splitting and forming at rates he can’t handle, which are causing the flare ups. The energy is being propelled from his body in all directions. Megala explains that if unchecked, these explosions will only get worse. Nathaniel is in immense pain. He’s trying to get his head on straight so he can fly back to the Continuum. Except when he turns around, Superman, Green Lantern (Hal Jordan), and Cyborg arrive. The Watchtower noticed the energy spike and the three of them decided to investigate. Immediately, they talk about how unstable he is. A reference is made to his N52 run when he met Flash. Atom explains to them what’s going on. Instead of acting like children and fighting because of their differences and fears, the four of them talk like men. Captain Atom tells Megala to talk to them via Cyborg’s computer. Megala warns them of the seriousness of Atom’s flare ups and they plan to get him to safety. Another flare up soon starts. Green Lantern does his best to contain the energy, but when they get over Kansas, he loses control and Captain Atom unleashes his quantum energy on the citizens of Kansas. Superman does his Superman thing by jumping in front of some of the quantum blasts. Green Lantern hits blasts away with his ring, and Cyborg does the same with his sonic cannon. The damage is done though. A good portion of the city has been destroyed because of Captain Atom. The issue ends where it began. Atom has successfully removed himself from the world. General Eiling doesn’t care about him. He goes on and on about how much of a waste he was. Megala agrees, but not for the same, selfish, nationalistic reasons. He says the last lines of this issue and they are heartfelt. He says, “I am by no measure a religious man. As a scientist, I harbor no illusions about an afterlife. And yet, now that his tortured existence on this Earth has come to an end….I’d very much like to believe Nathaniel Adam is in a better place now.” His words are on the top of the last page and we see a naked Nathaniel Adam, in human form, who has been transported to the year 1994. If you love the tragic nature of this character as much as I do, then this story is right down your alley. Human nature, science, and the hero’s journey are all present in this issue. Feeling bad for Captain Atom is second nature at this point, but this story is taking us on a new journey. Never before has Captain Atom’s powers spiraled out of control like this. Sure, he’s been depressed about his role in society, but never enough to take his own life. I just want the character to win for once. Hopefully this series provides that. If you enjoyed his previous run, pick this up. If you were interested in the character at all, pick this up. Captain Atom is as hopeful as you can get in comics. Faced with almost no stake in humanity, he’s stood tall. This series though opens with a melancholy bang as Captain Atom is transported back in time. As Dr. Megala said, I hope his tortured existence as a quantum mistake is done, maybe he’ll become something better after the accident. Maybe not. No doubt an intriguing start. Writer Cary Bates did a great job in this issue tying everything together as well. There’s more than enough for new readers to get a feel for the character. My only complaint is that some of the expositional dialogue feels forced. Especially Cyborg. He tries to be the comic relief in this and it doesn’t feel right to me. It’s a tough spot to be in for a writer, because Atom’s past should be explained more, even though it doesn’t necessarily need to be. Overall though, this story is sensational so far. I would recommend it to anyone who loves great comic book characters and a good story. Enjoy this review and want to go buy this series? Good! Go to your nearest local comic book shop to pick this series up. My next review is going to be the second issue of this series, so if you don’t have the money to buy it now, or want to stick around, please do so. But I highly recommend you buy it, read it, and then read my review. Until next time! Peace, Love, and Comics!